Australia withstood a pulsating spell of fast bowling from Pakistan’s Wahab Riaz to set up a meeting with India in the World Cup semi-finals. 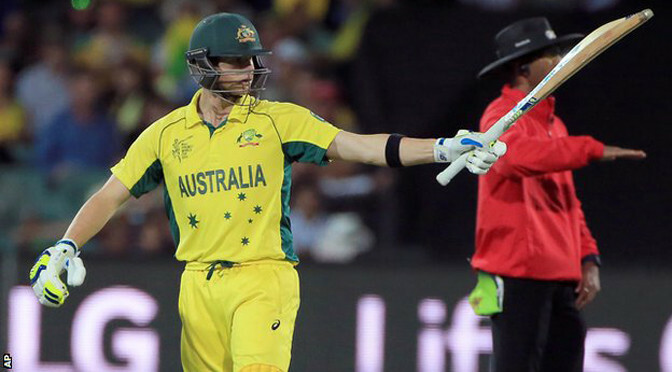 Australia’s hopes of chasing 214 looked in peril when Riaz removed David Warner and Michael Clarke to leave them 59-3. But Steve Smith countered with a measured 65 and Shane Watson capitalised on a dropped catch to steer Australia home with an unbeaten 64. Earlier, Josh Hazlewood took 4-35 as Pakistan slid from 97-2 to 213 all out. Australia’s victory keeps them on course for a fifth World Cup victory and sets up a chance to avenge their 2011 quarter-final defeat by India in Sydney next week.